The CIA is brewing beer—no, not that CIA, the Culinary Institute of America in Hyde Park, NY. Beer has finally cemented its place in the high-end culinary world. First restaurants like Eleven Madison and Gramercy Tavern began including craft beers on their menus; then Luksus, a tiny tasting-menu-only restaurant located inside beer geek heaven Tørst received a Michelin star; and now the lauded CIA is offering a course in the science of beer, complete with its own on-campus brewery created in partnership with Brooklyn Brewery. The Brooklyn Brewery at the CIA is located in the college’s gorgeous new student commons, The Egg, which features a rotating student-run fast-casual restaurant concept, panoramic views of the Hudson River and, for the first time in over 20 years, beer on tap made just yards away. It’s encased in glass, warehouse-style windows (a nod to Brooklyn Brewery’s Williamsburg neighborhood), so students passing through can watch the amateur brewers in action. 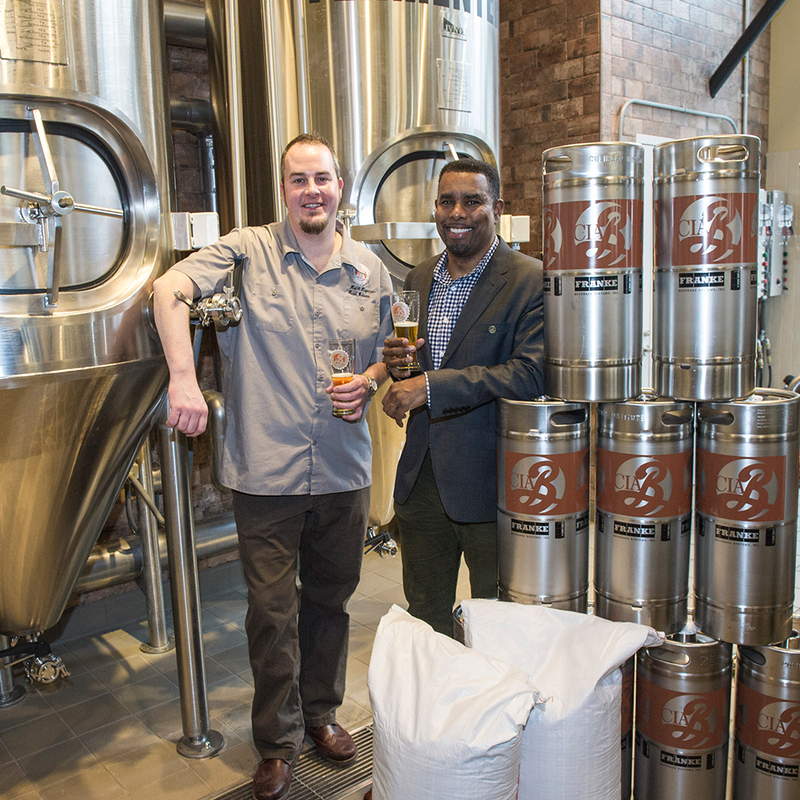 The brewery serves as a laboratory for bachelor’s-level students participating in The Art and Science of Brewing, a newly launched class focusing on the production, tasting and marketing of beers. It features boldly labeled equipment and three fermentation tanks, which allow for three beers to be in production at one time. The first three cleverly named, culinarily themed beers produced are now on tap in The Egg. Two, the Cleaver IPA and the Mise en Place Wite, are collaborations between Brooklyn Brewery’s Garrett Oliver and the CIA’s head brewer Hutch Kugeman (formerly of Crossroads Brewing Co.). The third, the Cast Iron Stout, is the most recent class project. The brewery isn’t simply going to be a stand-alone project that supplies the campus restaurants and (of age) students with beers. There are plans to further integrate the program into the school. The pastry department is already putting the spent grain to good use in cookies and waffles. 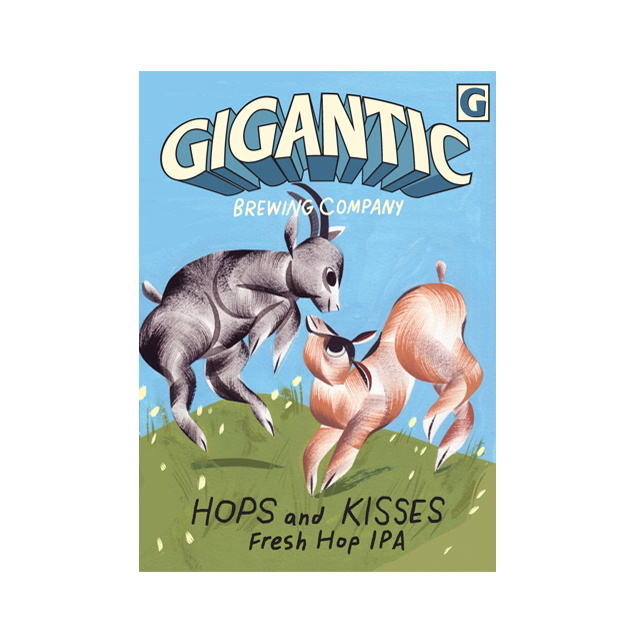 In the future, Kugeman hopes to grow hops on the campus grounds to use in the beers and also plans on incorporating the herbs and botanicals already growing in the school’s gardens. There is also talk about collaborating with the culinary science program to develop rotovapped flavors for the beers. 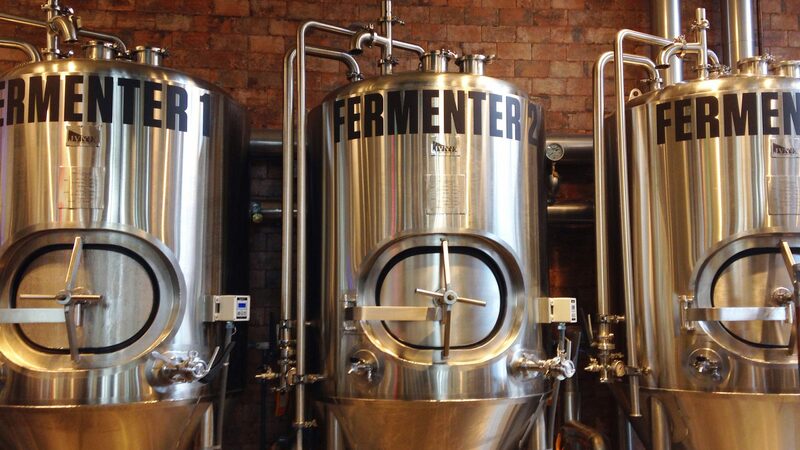 Want to taste the brews? You’ll have to head to the school’s Hyde Park campus. There, you can purchase the beers by the growler at The Egg or, starting in January, drink them on draught at the American Bounty Restaurant.